2 - We give you an invoice or quotation to pass on to your employer . 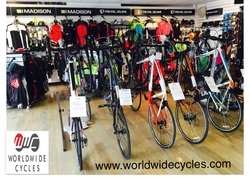 We also accept vouchers from "Bike 2 Work" and "cyclescheme.ie". 4 - You come in to collect your bike whilst repaying the amount less tax and levies usually over a 12 month period .